When night begins to fall on the sleepy, rural town of Woodinvale, the shadows and fog rolling in bring with them more than just a chill shiver. A living nightmare erupts as the once peaceful community is overrun with the restless dead…scratching and clawing their way to the surface with an insatiable hunger for human flesh. Now only a handful of unlikely Heroes are left, banding together to fight for their very lives. On a night that never ends, the only thing worse than death… is becoming infected. While some players fight for survival, others have already fallen to the rotting plague and now hunger to feed their hatred of the living. As a Zombie player, you get control of the unending waves of Zombies spreading over the town like a sickness. You also have the ability to sow dissent amongst the Heroes as fear and primal instinct for self preservation take over. Heroes that fall will often rise again to join your Zombie ranks and terrorize their former friends. With a cast of horror movie archetype Heroes and hordes of blood-thirsty Zombies, each Scenario is designed to play out like the plot of a movie; desperate Heroes racing against time to accomplish their goals… sometimes it’s as simple as just trying to live through the night. So put down that popcorn, grab your shotgun, and hide your brain; the Zombies are coming and this could be your Last Night on Earth. Last Night on Earth, The Zombie Game is a survival horror board game that pits small-town Heroes head-to-head against a limitless horde of Zombies (players can play on the Hero team or as the Zombies). 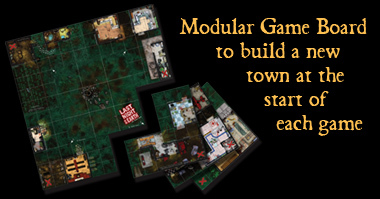 A modular board randomly determines the layout of the town at the start of each game and there are several different scenarios to play, adding lots of replayability. 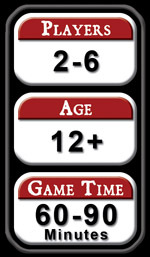 Fast Paced Game Play with Easy To Learn rules allows players to jump right into the action, while Strategic Depth and Strong Cooperative Play keeps the game interesting. One or two players control the zombies, while the rest control heroes. To achieve a horror movie feel, all of the art for the game is photographic and the game comes with a CD Soundtrack of original music. Each Game Round is split into two Turns, the Zombie Turn and the Hero Turn. During the Zombie Turn, the Zombie player(s) get to move and attack with their Zombies as well as possibly spawn new Zombies. During the Hero Turn, each Hero gets to take a Move Action (move, or Search if in a building) and attack, in any order they wish. The game ends when either the objectives of the Scenario are completed or when the Sun Track Marker reaches the end of the track.